Ever wonder what the deal is with some of the crazy Apple rumors? Refer to this handy Apple Rumor Publishing Guide from JoyOfTech. 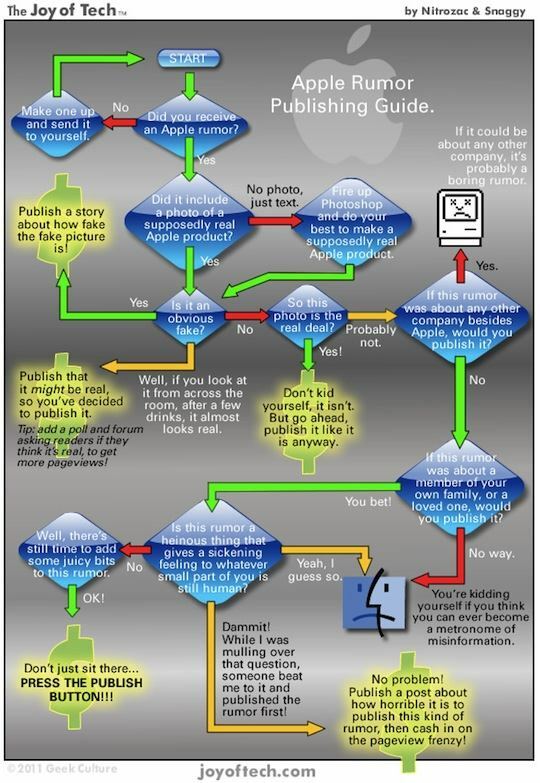 This is a hilarious flowchart that is frequently dead-on regarding the often silly and sometimes just outright fictitious Apple rumor mill. This cracks me up because everyone knows it’s true. Sure, there are a few legitimate sources out there, but there are plenty more that just make things up to get attention. And yes I’m posting this knowing full well that we publish rumors ourselves, although we try to focus on solid sources and patents as a basis for citation. And no, someones imagination should not be called a “source” to justify the fabrication of a rumor. Heads up to MacGasm for finding this. Gee you mean like the iOS 4.3 rumors today even though Apple publicly gave the release date as March 11? Or the iPhone 5 made-out-of-ivory rumors? This stuff is so stupid, they’re all full of sh*t.
How to tell it’s a slow news day: ridiculous Apple rumors surface with no support AKA why I unsubscribed from 90% of Apple sites.